Bhagavan Vasishtha, while instructing Sri Rama in Atma Vidya, also teaches what Sri Krishna will teach to Arjuna in the battlefield in a future age. Sri Krishna-Arjuna dialogue is described in seven sargas consisting of 254 slokas. This version of the Gita in the Yogavasishtha (Nirvana Prakarana-Purvardha-sargas 52 to 58) has great utility in several ways. On the strength of it, the main teaching of the Gita can be correctly determined. Further, the teachings of Jnanayoga are not found in a complete form in the Mahabharata version of the Gita. 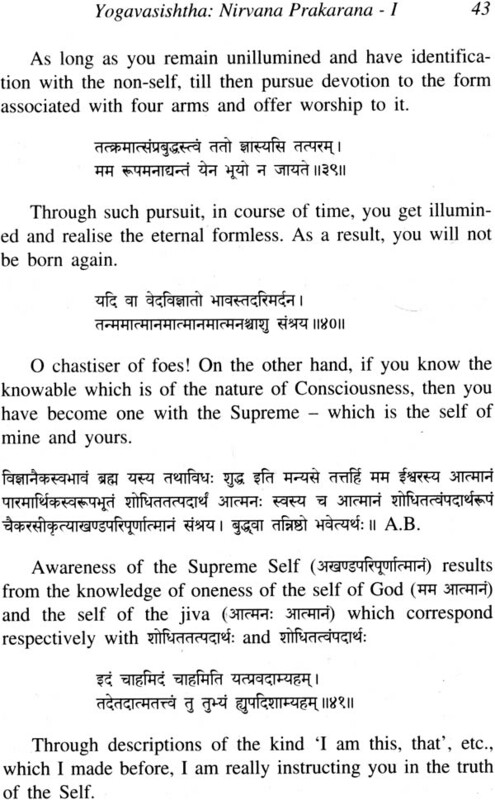 The Yogavasishtha version has completeness. Arjuna imbibes the teachings and becomes a jivanmukta, worthy of even being cited as an example by Vasishtha to Rama. Arjuna's main problem, viz., anguish over the death of the near and dear in the battlefield is more fully addressed, and Arjuna is told that life and death make no difference in the spiritual plane. Arjuna's declaration 'My delusion is gone' is also more convincing. Krishna's teaching can dispel the delusion of not only Arjuna but of others as well and that is the reason for the current publication. The reader may find that there is greater transcendental flavour in the Yogavasishtha version of the Gita than in the Mahabharata version. In the former, the Supreme Reality addresses the soul and in the latter, the Supreme Lord addresses the devotee. Since the teachings of the Yogavasishtha version of the Gita are more in conformity with those of Sri Vasishtha, a summary of his main teachings is furnished in Section I of the work to enable the reader to better understand the Gita that follows later. Yogavasishtha is a magnificent and well-known on Vedanta Philosophy containing nearly 28,000 verses. 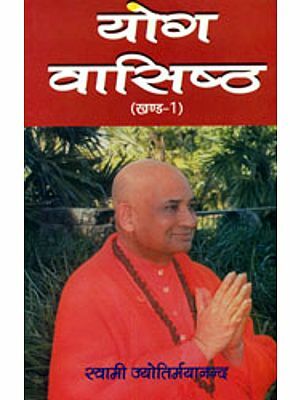 Its poetic excellence and the depth and grandeur of its exposition of Vedanta Philosophy have earned for the work a very high place among spiritual literature. 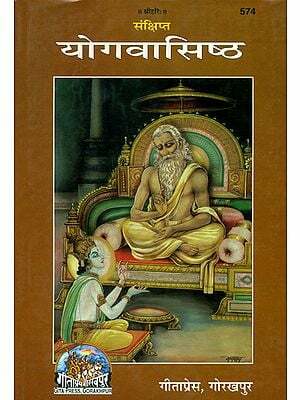 Its authorship is traditionally attributed to Valmiki and its teachings are in the form of spiritual instructions imparted by Sri Vasishtha to Sri Rama, the hero of Ramayana. During the course of the teachings, Sri Vasishtha imparts to Sri Rama the spiritual instructions of Sri Krishna to Arjuna in the battlefield in a future age, which dialogue is presented as being foreseen by the all-knowing Sri Vasishtha. Thus the narrative avoids any apparent anachronism. But, Vasishtha's version of the Gita. The Gita, being one of the three important canonical texts of the Vedanta, has been interpreted by Advaitic Commentators beginning with Shri Sankaracharya as advocating Jnana as the ultimate means to liberation. In that sense, we may conclude that Vasishtha's version deals only with the Wisdom Teachings of the Gita and that too, in their purest form. 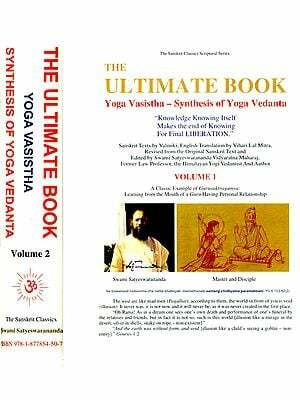 This important portion of the Yogavasishtha is published for the first time with an authentic English rendering by a person who has devoted his life to the study and practice of Vedanta, more particularly, Yogavasishtha.